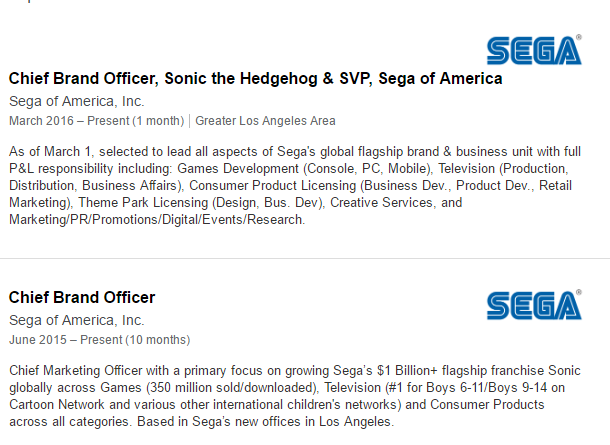 So we all just found out that Ivo Gerscovich is the new head of the Sonic Brand for Sega of America and looking on his LinkedIn profile page there are a number of bullet point details as to what might be in store in the future for Sonic. Now it doesn’t specifically say if all of these are just for Sonic, or if they include some more general Sega stuff… but these are the details. You can probably tell already which of those apply to Sonic, although with Sega hinting that they were looking into bringing some of their other brands to TV this might be an early indication that plans are moving ahead. But one of the most curious items on the list ‘Theme Park Licensing’, we must remember that Sega do have ‘Theme Parks’ out there such as Joypolis (both China & Japan) & Sega Republic in Dubai. It’s possible that this is related to those, however with Joypolis being controlled by Sega of Japan and indications on Joypolis’ website also hint that SOJ handles Sega Republic too. But regardless as to what it means, some of you will probably be happy to see ‘console’ on that list. Another instance where SEGA chooses to ignore that a massive portion of the Sonic fanbase is adult. It doesn’t mention anything about their demographic. I’m glad someone realizes that. But the fanbase isn’t the only thing that matters. The important thing is making it so that Sonic appeals to the general public. That way, the sales and revenue would be better overall. So… adults don’t go to theme parks, play videogames or watch cartoons? They also don’t buy Sonic/SEGA merchandise? Like, I really fail to see where this came from. Woah wait what Sonic games on consoles in a future perfect not Nintendo consoles a lot forever & it better be not Sonic Boom games, in a future because I already know that Sonic fans hate Boom a lot of video games not a actual TV show just Boom games in general alright some of them do like it or some of them don’t like it!